The Pettersson D500X ultrasound recorder looks a bit like an old-fashioned transistor radio, with square buttons, a modest display screen and a built-in microphone. But despite its unimaginative appearance, the device can detect the echolocation sounds made by bats and, with the help of software that identifies the bat species involved, is helping scientists reveal new information about the movements and migration behavior of local bat populations. Biologists at the Rhode Island Department of Environmental Management (DEM) and the University of Rhode Island have deployed the bat detectors throughout the state this year in a variety of ways. DEM wildlife biologist Charles Brown, for instance, mounts one on the roof of his truck as he periodically drives five routes around the state to look for trends in bat numbers and to compare his findings with those driving similar routes in other states. He also places the devices in various state wildlife management areas to scout for locations to trap bats for more detailed study. The most revealing use of the detectors, however, has been as a way of monitoring bat migration through Rhode Island. Brown selected several locations along the Rhode Island coast to place the detectors for long-term monitoring of bat movements. Every week since early August, he has downloaded the data from the detectors to learn what he can about the seasonal movement of bats. While he admitted he didn’t know what to expect with the data he was collecting, he was somewhat surprised to learn that bat migration appears to begin much earlier than he anticipated. 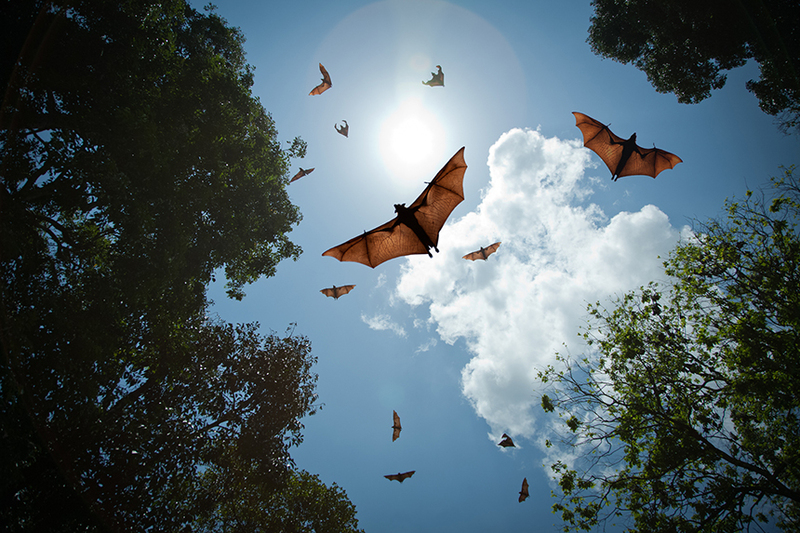 Bat migration is believed to continue through October and early November. The only difficulty with the bat detectors is that it’s impossible to know how many bats are being detected. Most of the bats Brown has detected are red, hoary and silver-haired bats — collectively called tree bats — all of which migrate south each fall. He also occasionally detects small numbers of little brown bats that migrate north to hibernate in caves and mines in New Hampshire and Vermont. Little browns have declined dramatically in the past decade due to the effects of white-nose syndrome, a fungal disease that has killed millions of hibernating bats throughout the Northeast. Big brown bats, many of which spend the winter hibernating in Rhode Island, are also detected. URI professor Peter August has conducted similar monitoring of bat migration at Napatree Point in Westerly using the same kind of detector, and his results mirror Brown’s. August plans to continue to monitor for bat activity at Napatree until he detects no bats at all. By combining data from the detectors with anecdotal information from other sources — such as surfers who report large movements of bats at sunrise and wind turbine owners who report dead bats at the base of the structures — Brown and August are piecing together the story of bat migration in Rhode Island.